It seems like forever ago but early this spring I shot a spread for MN Meetings & Events Magazine styled by the ever so talented Marsha Hunt & Bridget Connell, co-owners of Haute Flower Boutique, & Event Coordinator Emily Donovan at Architectural Antiques in Minneapolis. It's finally been published!! Here is a quick link to the online edition of the magazine...feel free to skip ahead to page 26! Marsha & Bridget set out to create a table top that radiated the feeling of a sultry simmer night in the city with an eclectic, urban vibe. Inspired by Architectural Antique’s unique venue space in Minneapolis, MN with thousands of fascinating antique pieces arranged in artful disarray, they wanted to create an island of brilliantly colored florals underneath the warm glow of dozens of shimmering chandeliers. 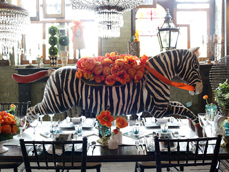 It was love at first sight once they spotted the antique painted metal zebra; they knew they had found an inspiration point upon which to build the entire look around. The Zebra is originally from a carnival ride, most likely from the late 1940’s. Its aluminum body is hand painted in a graphic black & white, complete with leather reign. The focal point of a tablescape is usually the floral centerpiece, but they loved the idea of taking this one-of-a-kind antique piece & building our floral design around it. They created a “saddle” of pavé style orange flowers to provide a jolt of color & then added the additional floral pieces to the tablescape to anchor the color scheme at both ends of the long table. The sheer unexpectedness of it provides a jolt of color & excitement & helps create a carefree, summery, almost carousel-like atmosphere for this event. As a focal point, it created a fun & whimsical feel to the entire tablescape & allows them to see how the non-traditional use of an item can create a unique & dramatic effect. Not only is Architectural Antiques a great location for meetings but it's an amazing space for you to book your wedding & reception! Hint hint...I would love to photograph a wedding here!